Russian delegation leader, secretary general of the Multisport Association of Russia Alexey Kylasov told the Information Agency “All Sport” how Russian national team had been preparing for the World Wrestling Games FILA and performed at the event. ‘Unfortunately, in Russia the development of wrestling styles federations of which are FILA members is still a difficult task, complained Alexey Kylasov. In most cases those entering the World Wrestling Games FILA program do not have any official support or often even recognition. In Siauliai tournaments on the following wrestling kinds took place: alysh belt wrestling, beach wrestling, grappling, pankration, Korean wrestling Ssireum and Tatar Kuresh . And though those were the 4th Games (the first and second Games were held in Antalya (Turkey), the third – in Albania Tirana) our country’s team took part in the Games for the first time. And our athletes participated in tournaments of three sports out of six. Not everything went smoothly on the organizational stage. 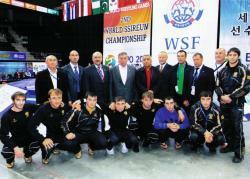 FILA national member is the Russian Sport Wrestling Federation (RSWF). However, the major aim of the RSWF is to prepare wrestlers for the Olympic Games competitions of Greco-Roman, freestyle and women’s wrestling, but the Olympic styles of wrestling are not included in the program of the World Wrestling Games FILA and the national federations of the wrestling styles which are included in the program are not the RSWF members but the MAR ones. Meanwhile it was the MAR that formed the national team for Siauliai-2009. Nevertheless, as the result of the negotiations with the RSWF we created a united Executive Committee for preparation of the Russian national team for the participation in the World Wrestling Games. The RSWF president, Olympic champion Mikhail Mamiashvili said at the first meeting the that the RSWF would support any actions for FILA events preparation and wrestling propaganda, thus, the Multisport Association of Russia would get maximum assistance in any questions regarding the World Wrestling Games FILA. I want to thank specially the RFSW for the fact that all our team was equipped as the national team. The secretary of state the RSWF first vice-president Georgy Bryusov said, ‘to dress Russian wrestlers in the uniform usual for the FILA people’s eyes’. Alexey Kylasov also spoke about the sport results if the Russian national team performance at the World Wrestling games in Siauliai. “The main feature of Russian wrestlers’ participation is the highest effectiveness of their performance. All the eight Russian wrestlers who took part at the Games won medals. FILA President Rafaёl Martinetti called such a result of the Russian team phenomenal and invited all the members of the team to take a photo with him. “Even in non-Olympic disciplines Russian athletes are ready to take all the medals,” he said excitedly. Considering this evaluation, I suppose, it is absolutely necessary to name the two coaches of the Russian team – Soltan Chagarov and Husey Dotduev. In Siauliai their three and two athletes correspondingly mounted the podium”, noticed Alexey Kylasov.